The box canyon continues to fish well. A few fish looking up and eating golden stones in the morning but a hopper dropper rig will consistently pick up trout and of course a few whitefish. I really like Schroders Tan Para Hopper in a #8 in the box. It works as both a golden as well as a hopper and it’s really easy to see in the turbulent water of the box. Also Rainy’s Hopper in a #8 is a good choice, not as easy to see but probably one of the most durable files around and am pretty sure it could float an anchor! As far as dropper patterns go a the Tan and Brown Rubber Legs in #8 and #10 and Red Zebra midges in #18 will work. I would suggest you have a good selection of small nymphs in your fly box as they will work well in the whole area. Cocktail, Pheasant Tails and Two Bit Hookers in both tan and red in size 14 & 16 are some of my favorites. This is just to name a few. Streamers are also fooling fish. Fishing sculpin patters on overcast days can be lots of fun! Mikes Wool Head Sculpin in Olive or Tan always turns fish in the box and I also like to fish Slump Busters. These patters work well not only in the box but throughout our entire area. By far some of my favorite water on the Henrys Fork, the Ranch continues to fish well. The Trico’s have started to go and consistent hatches of PMDs as well as Callibaetis have fish coming up to eat dries throughout the whole ranch section. Wood Road 16 has been my hangout lately. I like to fish the water well above the cliffs. 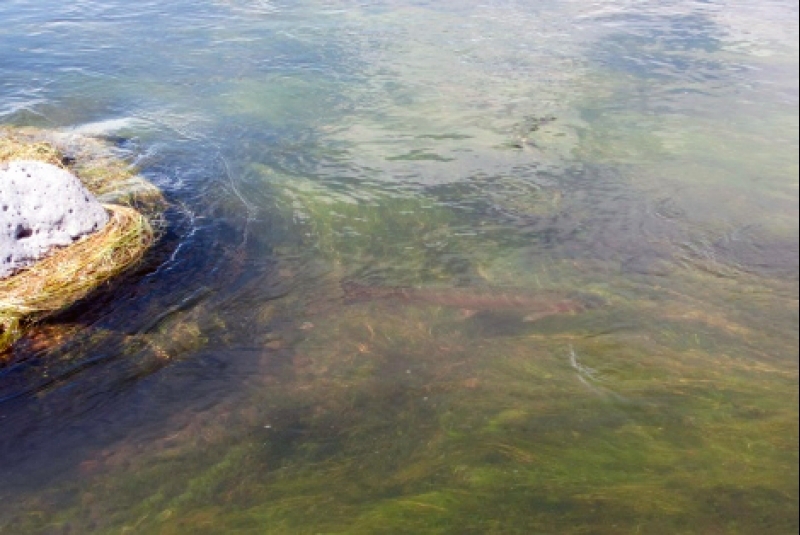 Consistent hatches have lots of fish up and it does not get as much fishing pressure. I have all that water to myself on most evenings. In the mornings watch for the Tricos to get going between 9:00 and 10:00. The #20 Hi Vis Trico has been fooling a few fish and I have also found the #18 Two Wing Trico and the #20 CDC Trico will turn fish. You will also see PMDs so be prepared to change gears. A #16 Brooks Sprout P.M.D. or a #16 Hackle Stacker will get some attention. I also Like #16 and #18 Organza P.M.Ds I also really like Evenings on the Ranch. As of late trout seem to be keying on spent Callibaetis so fishing spinners has really been good. A #16 or #14 Hi Vis Callibaetis Spinner has been working very well. Terrestrials like hoppers beetles and ants are also producing good action. Honey Ants don’t show up every day they can show up. You’ll know it by the explosive rise forms. We have a number of good patterns in our shop to imitate these important insects. There is always conversation in the shop this time of year about tippet sizes and what works best. Tippet size will affect flies differently. For example 3X tippet will not work when trying to present a #20 Trico to well. It’s not going to look natural on the water. On the other end of the spectrum 7X tippet works great but the drawback is playing large trout to exhaustion resulting in the mortality of some of the larger trout in the Ranch. Personally I like to use 5x in the Ranch but sometimes I will go to 6X when fishing Tricos. I like Rios Supple Flex as it tends to stretch well and allows you to put more heat on larger fish and get them to the net quicker. The lower end of the river is low but the cooler temps have brought down water temps. Hopefully in the very near future irrigation demand will start to drop and we will see more water in the river. Mornings have been best for dry fly action. Try Hoppers along the banks as well as streamers. Again I like #8 and #10 Schroders Para Hopper and Rainey’s in the same size. The Moorish Hopper and Thunder Thighs Hopper also will work very well. As the day heats up on the lower end fishing hopper dropper rigs has been very successful. I really like Two Bit Hookers in both red and tan dropped 4 to 6 feet below your favorite hopper pattern. You can also find good Trico action in the slow water in areas like the Fun Farm. We have been running lots of trips on the South Fork this year with good reason! The Palisades Reservoir had great carry over from the prior year. As of this writing the Palisades is at 63% of capacity. That’s great news for fishing. Water temps will remain consistent and so will the May Fly hatches. Hatches of Pink Albert’s occur daily on the South Fork and finding willing fish in riffles makes for a great day on this tail water. Keep a close eye on the flow charts and if see a drop try an early run through the Canyon section with Golden Stone patters. Elden’s Ants skated along banks and riffles at first light can produce some huge fish! There have been fish in the riffles that are keying on Mahogany Duns. So keep watch on the insects you see in the riffles. I like to have the nymphs, emergers and duns as well as spent patterns in my fly box. The banks on the South Fork are hit and miss. I like to fish banks in the mornings and then again in the evening. Again Hopper patters and Golden Stone patterns work well when the banks are fishing. One of my personal favorite patterns is the Dornan Water Walker in green. 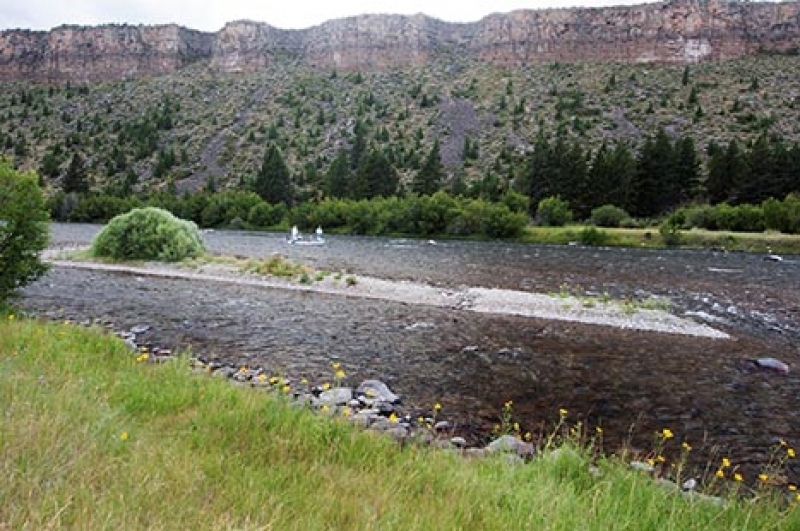 This continues to be one of my favorite rivers in Idaho, not just Idaho but everywhere! I love the Teton. The lower river has dropped quite a bit but continues to fish well. 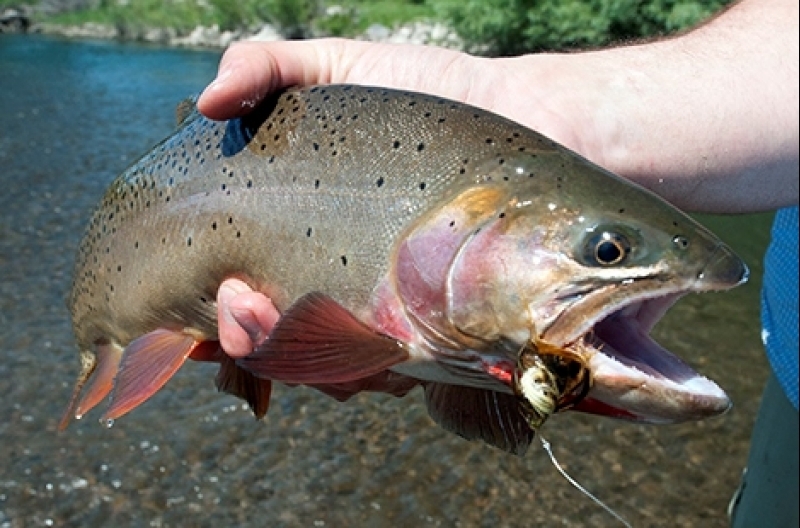 I always find myself wading the Teton in the evening and if conditions are good the Caddis hatches phenomenal! If you find yourself on the river in the evening and caddis are thick and rise forms are numerous then swing a Mikes Tan Caddis Emerger through the rise forms. Be prepared for some violent strikes! Also fish will eat Mikes EZ Caddis with that same Caddis Emerger dropped a foot or so behind the dry. The upper end from the Canyon down to the old damn site has more water in it with plenty of fish chasing streamers and picking hopper patterns off the surface. The Madison River has taken a bit of a hit with warmer water temps but has been fishing well in the evening with caddis patterns. If you’re in our area on an overcast cooler day then heading to the Madison is a good bet. I would have P.M.Ds and Hopper patterns. As the day heats up you may have to concentrate on running nymphs in the deeper holes and runs. This is another place that’s pretty special. I had my sons with me in the park last week and between looking at buffalo, elk and geyser’s we managed to get a little fishing in. 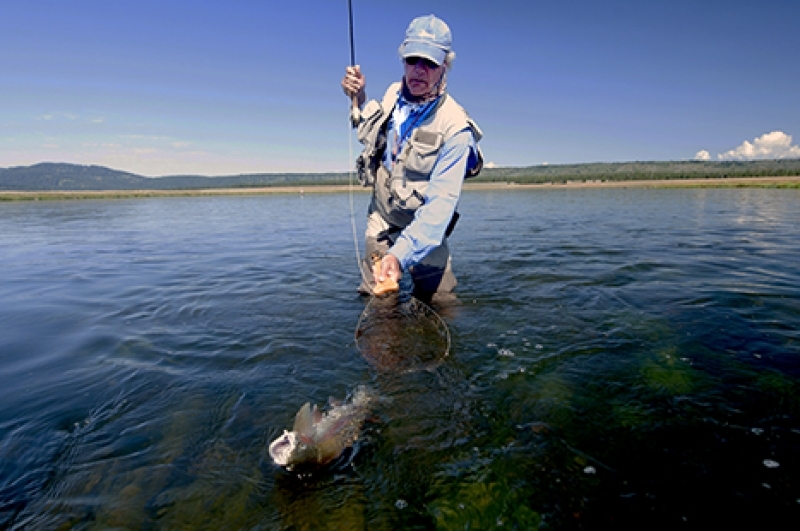 The Yellowstone River was probably the most consistent with Cutties rising on Hoppers. Both boys also did ok swinging soft hackles in riffles and off drops.